Renaldo Nehemiah was born March 24, 1959 in Newark. He grew up in Scotch Plains and attended Scotch Plains – Fanwood High School. He took up hurdling as a ninth grader on a dare. Renaldo injured his hamstring as a sophomore and the injury still bothered him as a junior. The injury was treated by the Jets team doctor and once healed it never bothered him again. Finally, as a senior in 1977, he was completely healthy. Renaldo soon established himself as the nation’s top prep hurdler under coach Jean Poquette, who convinced him that training should be hard and races should be easy. He often trained on 45-inch hurdles. Renaldo’s work ethic would become the stuff of legend. Renaldo stood only 5'9" and weighed around 150 pounds when he graduated—small for a hurdler who had already cracked the 13-second barrier in the 100 meters. He grew almost four inches and packed on 20 pounds of muscle after taking his show south to the University of Maryland. As a freshman, he was the NCAA champion. As a sophomore he was the star of the prestigious Penn Relays, being named MVP of the meet, and won another NCAA title. Prior to his junior year, Renaldo decided to accept an offer by Puma to turn pro. He continued to study at Maryland, but by the rules of the day he was no longer eligible to run for the school. Renaldo started to focus on the 1980 Olympics, hoping to peak in time for the Summer Games. Renaldo’s only rival was Greg Foster of UCLA. For several years, they were so far ahead of the competition that it was only matter of who would finish first, and who would finish second. In 1981, both turned in their best times in the same 1981 race. Renaldo edged Foster with a time of 12.93 seconds in the 110 meters. That record has since been broken, but in three decades only a few hundredths of a second have been shaved off it. Unfortunately for Renaldo and hundreds of other athletes, the U.S. boycotted the Olympics in protect of the Soviet Union’s invasion of Afghanistan. Unwilling to wait another four years to perform on the world stage, he accepted an offer from the San Francisco 49ers to play pro football. He joined the 49ers in 1982 and was a member of the Super Bowl XIX champions in 1984. As a football player, Renaldo’s main value was stretching the defense and drawing two defenders deep down the field. 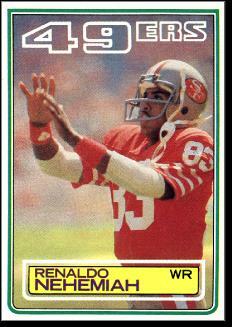 Renaldo returned to hurdling in 1986 after the 49ers drafted Jerry Rice. He was 20 pounds heavier, and it showed, as Foster was able to defeat him consistently. Renaldo continued to compete through the 1991 season. At 32, he could still run the 110 in under 13.2 seconds. He became a sports agent, working for Octagon and managing their track & field clients. During his track career, Renaldo set eight world records, all between 1979 and 1982—in the 50 meters, 50 yards (twice), 55 meters, 60 yards and 110 meters (three times). He also won ABC’s Superstars competition four times between 1981 and 1986.